The defendant, Charles Cui, was granted $2 million in tax increment financing funds by the City Council’s Finance Committee, which Burke then controlled, to develop a former Bank of America property at 4901 W. Irving Park Road, according to the indictment. Later, Cui was rejected in his effort to secure a permit from the city’s Department of Buildings for a sign to advertise one of his building’s tenants. Cui says that failure caused him to reduce one of his tenant’s rent by $750,000, costing his company that amount. In the indictment, Alderman A is listed as alderman of the 14th Ward, clearly referring to Burke, although it does not explicitly refer to him by name; Individual A is identified as being associated with a real estate consulting and project management firm in Chicago. Cui allegedly contacted his real estate attorney and told him he’d need to switch his business to Burke’s law firm, Klafter and Burke, in order to coax Burke into helping him get the permit granted. He hired Klafter and Burke but did not win the permit approval, according to the indictment. 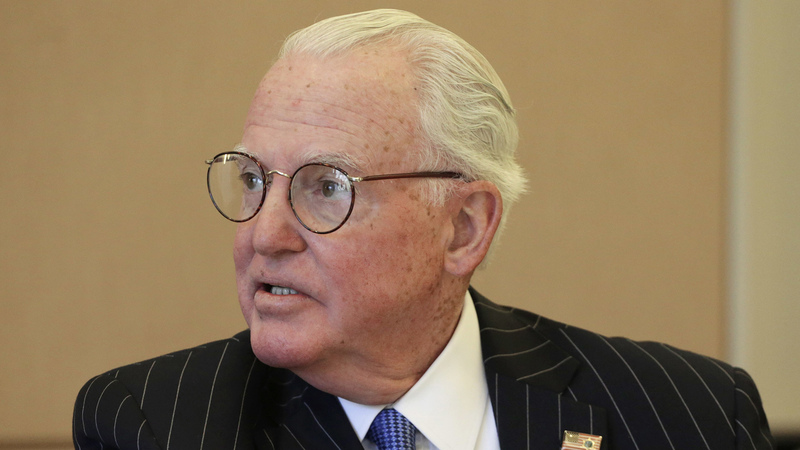 Burke is not charged in the indictment, but faces a separate count of attempted extortion for allegedly trying to shake down a Burger King franchisee to hire Klafter and Burke for property tax appeals. Prosecutors have until May 3 to return a federal indictment against Burke, and have indicated that the investigation is ongoing. Cui is also an attorney who operates an immigration law firm out of the building located at 4901 W. Irving Park Road, according to his website. “The recent allegations against him are baseless and it is our intention to prove his innocence,” attorney Vadim Glozman said. The Irving Park Road development is in the city’s 45th Ward. Cui donated more than $17,000 to outgoing 45th Ward Ald. John Arena between 2014 and 2018, and gave $4,000 to political funds controlled by Burke, state election records show. “I was disturbed to learn today that the developer of 4901 W. Irving Park Rd., Charles Cui, tried to circumvent our community process, and the zoning code, through nefarious means. Mr. Cui was unsuccessful in his efforts to secure a permit for an abandoned pole sign, which is prohibited in the pedestrian street designation that covers The Six Corners Shopping Distinct. “When Mr. Cui approached me about the rejected pole sign permit, I worked with him to find an alternative solution within what was allowed and would satisfy the needs of his tenants. Apparently that didn’t satisfy him, and he solicited Ald. Burke. “At no point have I had any communication with Ald. Burke concerning the sign permit or legal work for his law firm. “Mr. Cui has not received a penny of TIF funds to date because he has failed to uphold his end of the redevelopment agreement. He failed to meet the City’s requirements for MBE/WBE hiring, and he failed to lease the second floor theater to an arts organization, as required by the agreement. This case plays into the broader narrative the U.S. attorney’s office is trying to build about Burke and pay-to-play culture, according to one former federal prosecutor. He also says the feds could be sending a message to other developers with this indictment.